Server officially started on 31/05/2018, which is already half a year ago, despite the low online we keep our word and the server is still Online. Players who stayed on it are mostly casual players, we were asked by them to try to revive the server, so be it! There have been many changes on the server since the start, many bugs have been fixed, and we have improved its stability. We're still working on improving the files, so we're trying to fix all reported bugs quickly. If you play casually, you are looking for a server that has an active administration and will live long without wipe, then you should check it out! -Premium Account Coin (1 Day) 7x, everyone decides when he uses his Coins. -Maximum number of online accounts has been increased to 1 + 4. From1 lvl to 40 lvl players will receive Master's Blessing Buffs for 2h. I think that this should make reaching the 40 level more enjoyable, I believe most of you will agree with me that 1-40 is a very boring period. All these changes are designed to help new players to some extent catch up with the current players. Server reactivation is mainly directed to casual players who do not like to change servers often, to players who want to be sure that server will be standing for a long time without "Wipe" and allow them to play without loss. Officially changes will come into life on 21/12/2018 at around 8 PM CET, immediately after Maintenance. 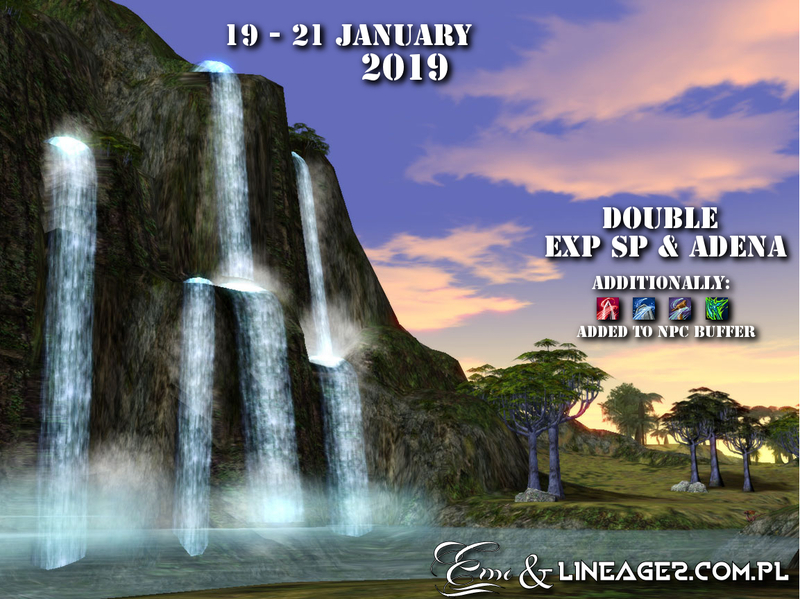 On the same day at 8 PM first Event is going to be launched: Double EXP / SP and Adena! -Free First and Second Class, class change available at the Cat (Class Manager) or in the pop-up window after reaching 20 and 40 lvl, after each class change player gets 5 Potions with Buffs and after the second class player gets additional Shadow C Weapon Coupons.